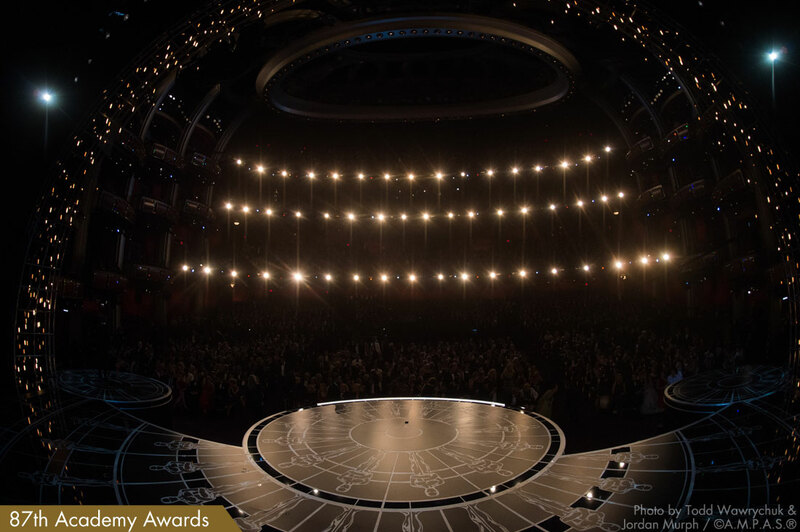 Take a look at these photos from the Oscars stage Feb. 22. Academy photographers Todd Wawrychuk and Jordan Murph took some fantastic photos from a unique angle Sunday night — from the stage. 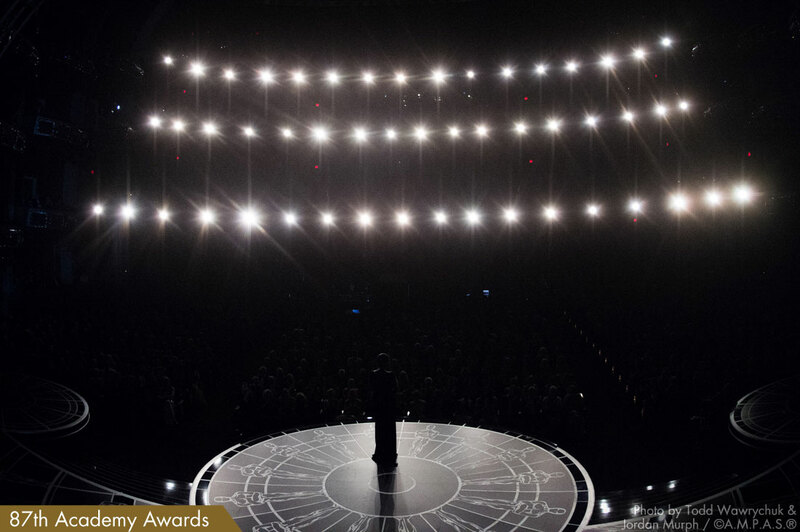 Take a look at these photos from the Oscars stage Feb. 22. Academy photographers Todd Wawrychuk and Jordan Murph were credited with some fantastic photos from a unique angle Sunday night — from the stage. Academy Photo Editor Trevor Totaro gave The Gold Knight some scoop about how that camera angle was pulled of. "The still camera was actually mounted to a remote drop camera on stage that was used for telecast," he said, via email. "The entire rig would raise and lower to keep out of the shot of the other broadcast cameras. The still camera used was a Nikon D4S using a 16mm fisheye lens. With the camera being fired remotely by a photographer in the house." 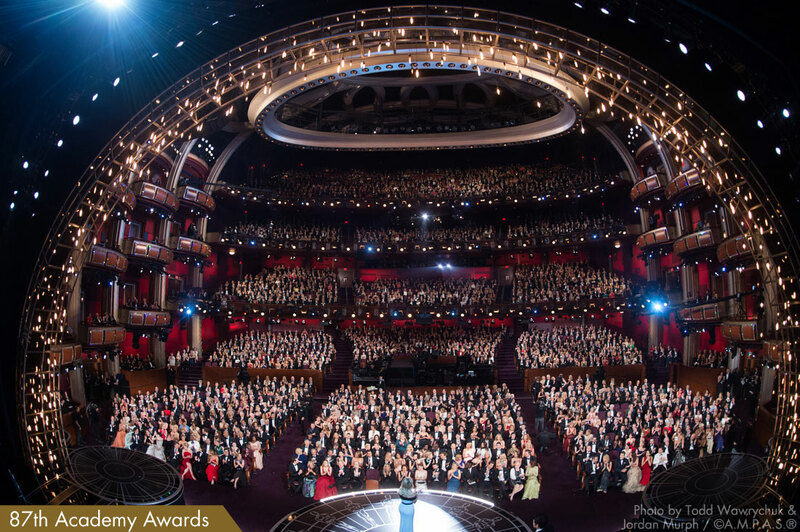 You can see Reese Witherspoon presenting in front of 3,000+ attendees, during the live Oscars telecast from the Dolby Theatre in Hollywood. 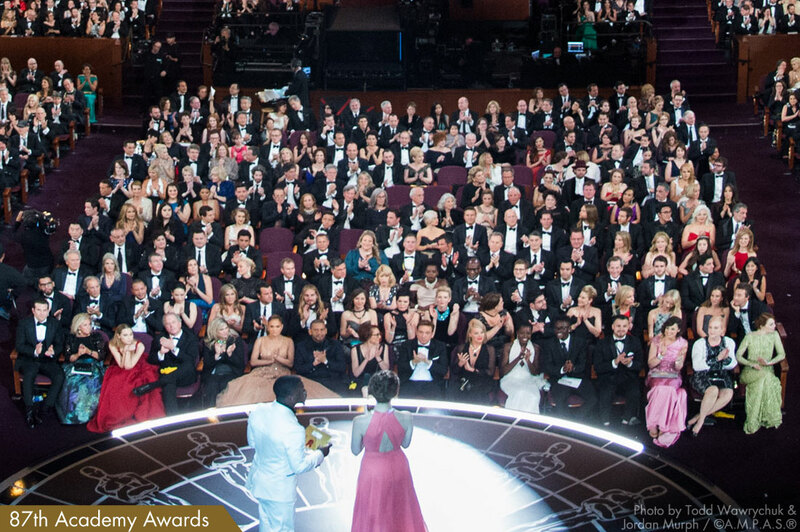 In a zoomed in photo, you can see who's sitting where, along with a few empty seats, as Kevin Hart and Anna Kendrick present. Light illuminates the beautiful stage, designed by Derek McLane. 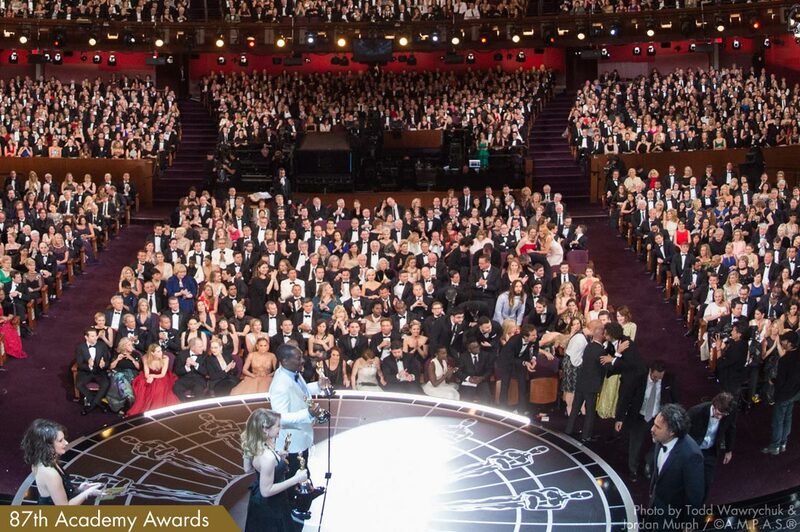 Nicole Kidman and Chiwetel Ejiofor present the Best Foreign Language Film Oscar to director Paweł Pawlikowskithe for “Ida” (Poland). The lights silhouette Jennifer Hudson as she performs. 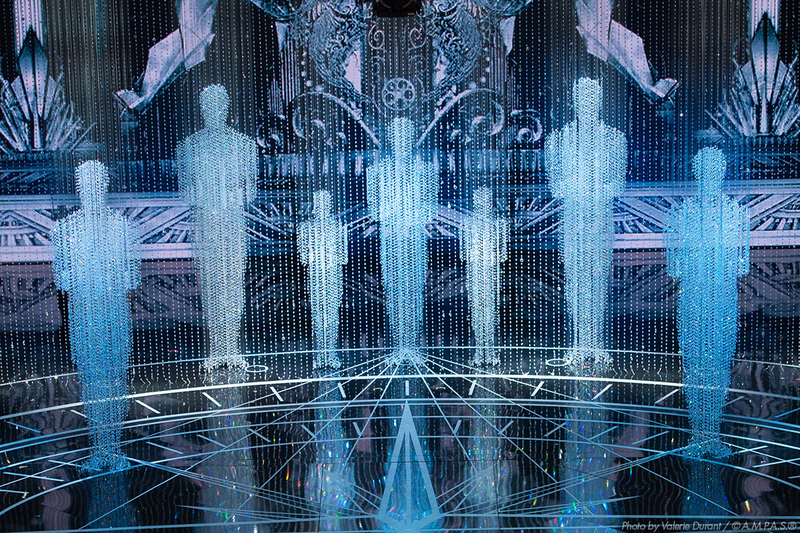 Eddie Murphy presents the Best Original Screenplay Oscar to Alejandro G. Iñárritu, Nicolás Giacobone, Alexander Dinelaris, Jr. and Armando Bo for "Birdman or (The Unexpected Virtue of Ignorance." 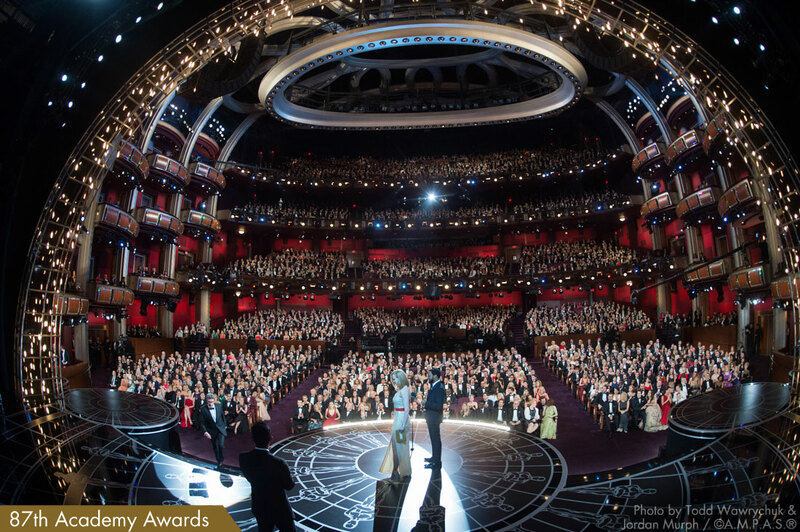 The 87th Academy Awards, for outstanding film achievements of 2014, were presented on Sunday, Feb. 22, 2015, at the Dolby Theatre at Hollywood & Highland Center, and televised live on ABC and in more than 225 countries worldwide.